James Stephen Whitehead was born 1796 in Willesborough, Kent in England. He was baptised on the 13th March, 1796 at St Mary’s Church in Willesborough. This was the family church. His parents were Stephen Whitehead (1772 – 1852) and Susanna Cook (1771 – 1852). The records of the day show that there were many Whitehead’s dotted throughout Kent in good number and it is reasonable to assume they had been there for some time. Anne Maria Stone or Annie as she was known through her life was born in 1803 in Kennington, Kent in England to Jesse Stone and Sarah Tappenden. She had one brother that I know of, William Stone. William would spend his entire life in the Charing area of the Kent district of England and raise quite a large family. It is likely at this time that there was a much larger family however current research is ongoing. James an agricultural labourer married Ann Maria Stone on the 26th April 1826 at the age of 30 in Ashford, Kent. Three miles from where he was born, James wife, Ann Maria Stone was born in April 1803 in Kennington. Her parents were Jesse Stone (1786) of Meresham, Kent and Sarah Tappenden (about 1784) of Boughton-Atulph, Kent. Both James and Ann Maria were locals from Kent. Their children were Ann Maria and James, two children (that I know of.) Mary Elizabeth Whitehead born 1829 and James Stephen Whitehead born 1832 in Lyminge, Kent. In the year following their daughters birth there were Whitehead’s who became enmeshed in the first of the ‘swing riots’ in Lyminge. I found a reference to a James Whitehead (unlikely to be ours unfortunately), a labourer of Lyminge concerning the breaking of Mr. Harmbrook’s machine in the Kent Sessions of October 1830. James was in court to give his deposition along with another labourer on the same matter a Stephen Knox also of Lyminge. On Sunday the 29th August 1830, it would appear that this James Whithead took part alongside perhaps forty other men of the area in the breaking of farming machines, namely in this case Mr. Harmbrook’s machine. It would appear there were also Prebble’s involved in these riots so it is not unreasonable to think that our James Whitehead and James Prebble were well known to each other. Was this our James Whitehead? Apparently not at this James was married to a Sarah in Lyminge and our James was married to Ann. Were they related? Possible. Were they in the same area around the same time yes. Would our James have known about the local goings on? Reasonably, yes he would have. He was no man of any particular finance himself. What I would like to draw you to is the most wonderful recounting of the events of that night and the following days and nights and the events that took place in and around the district. Quite miraculously for nineteenth century England, if not for the leniency of sentencing and fines of Sir Edward Knatchbull the magistrate then it is quite likely that many of the men involved could have gone the way of the Tolpuddle Martyrs. Those affected and the government of the day were so incensed by Knatchbull’s consideration toward the machine-breakers that the laws were subsequently amended and the sentencing became considerably harsher. Most of the men who were convicted only spent a few days in jail. For a rather vivid account I encourage you to read Derek Boughton’s Lyminge Swing Riots. From 1830 the ‘Swing Riots’ occurred across England. In fact the riots began in East Kent. These riots grew from dissatisfaction by the agricultural workers who for many generations had been guaranteed a reasonable living as cottagers and agricultural labourers. The introduction of machinery such as the threshing machines in agriculture meant that work that had taken many could be done by a few. Loss of employment brought the reality of not being able to make a living. The agricultural workers reacted during the swing riots by acting as mobs and destroying the machines. 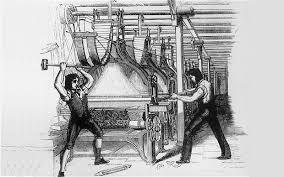 They became known as machine breakers. A crime that was punishable by death and at the very least transportation to Van Dieman’s land. To further complicate matters unrest and wars in Europe were having an impact in Britain. Three years of poor yield crops and the agricultural worker was being pushed out of his income and his home. On top of this, the complete reform under the new Whig government of the Poor Laws meant that the poor were becoming indeed the very poor. This system of poverty was becoming entrenched with little way out. In many cases families were being pushed from their traditional homes into factories in cities already over-populated. Extreme deprivation now faced this group of people who without proper representation felt disenfranchised and desperate. The factories offered low wages, no home and usually long hours and sub-standard working conditions. In many cases young children were being pressed into working in these factories to subsidise their families income. The competition for these jobs gave the factory owners all of the brokering powers. Overcrowding meant that disease was rife amongst the poorer people. Drunkenness, crime and violence increased expidentially as did the population. Crime and punishment were harsh and transportation to the colonies did not end until 1868. Great barques regularly left Britain laden with their human cargo. The only alternative for the very poor was to go into a work house or poor house. This was considered to be worse than death. The conditions of the work houses being terrible. In many cases the response to the poor in general was managed in an environment of blame, that the inmates had somehow allowed themselves to fall into this derelict state. James died ( I think) between July and September 1838 at the age of 42. At this time I am uncertain of the reason for his early demise. He left a widow and two small children. He died in Kent (Isle of Thanet). Ann Maria’s story has quite a twist to it. Within months she had remarried another Kent gentleman, who had a family of his own and was also recently widowed. James Prebble’s wife, Anna-Maria Gurr had died. (Yes your reading right he married two women with the same name). 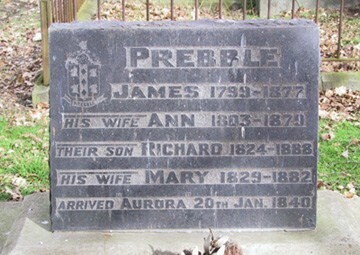 James Prebble had married his first wife in 1821 and she died in 1837. Their children had been born in Mersham in Kent. James was born in Folkestone in Kent. I have found references where Ann Maria Stone (Whitehead) also went under the name “Annie”. James Prebble (1799 -1877) married Ann Maria Whitehead on the 21st October 1838 in Meresham, Kent. Whilst he was not an agricultural labourer, indeed he had a trade as a carpenter, it is entirely reasonable to understand that as a result of all of this disharmony in Kent and with the promises and opportunities being offered in opening up New Zealand? Well when James Prebble saw an opportunity for his family to have a better life? He took it. By 1840 James and his children, his new wife and two stepchildren landed in New Zealand with a newborn son John Aurora Prebble. The Aurora is the name of the ship that brought them to New Zealand. John was born 12 days before they landed. They sailed to New Zealand as assisted immigrants, the first European settlement in what becomes known as Wellington. A further child Thomas Prebble was born in 1842. At the age of seven on the 22nd September 1839, James sailed with his family and new step-relations from Gravesend in England to their new home in far off New Zealand. In an effort to quickly settle this new land the British Government collaborated with the newly formed New Zealand Company to send free settlers to people the new colony. The decision was made to not send Convicts to New Zealand. To date the Maori people of New Zealand had knowledge of the Europeans as roughened sailors and whalers. Certainly not as settlements of white communities. The relationships between the Maori and the sailors and whalers had largely been convivial. Particularly as the whalers were a transient population and not settlers affecting land ownership. Three ships the Oriental, Aurora and Adelaide were chartered to take over 800 souls to establish a colony at what was being called Port Nicholson. The Aurora was a vessel of 550 tons and she was under the command of Captain Heale. There were 58 males and 90 females. They left the London docks at Gravesend on the 18th Septemaber 1839. The Adelaide and Aurora sailed out on the same day. The Oriental had set sail three days prior. Onboard were James Prebble aged 40 a carpeneter, his new wife Ann Whitehead (nee Stone) aged 36. James children, Richard Prebble aged 15 employment given as carpenter, Ann Prebble aged 15 employment given as servant. William Prebble aged 12, Edward Law Prebble aged 10, Mary Elizabeth Prebble aged 7, James Whitehead and his sister, Mary Elizabeth Whitehead aged 13. An older son, George Prebble opted to remain in England but eventually did come out with his family. His wife died aboard the journey leaving him with small children however he did later re-marry and join his father’s family in New Zealand. Twelve days prior to their arrival in New Zealand, James mother and stepfather welcomed a new child to their family. John Aurora Prebble who was born at sea. John never enjoyed good health and for many years was cared for by his half sister Mary who later married and became Mrs. Mary Dawson. On the 22nd January 1840 at the age of 8, James and family arrived aboard the Aurora at Port Nicholson in New Zealand. 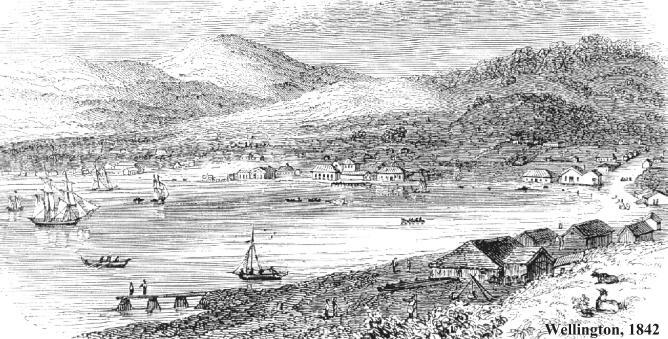 James was one of the new settlers to the fledgling community who began their new lives camping on Petone beach. James arrival and that of his family and the others onboard marks a fairly substantial day in the European history of New Zealand. They were the first European ship to arrive at what was then called Port Nicholson. This later became known as Wellington. Now if you are native of Wellington you will recognise this date as the day that is celebrated each year as Wellington Day! Two years later in 1842 another brother, Thomas Prebble was born. He was one of the first Europeans to be born in the infancy of European settled New Zealand. Over the next ten years the Prebble & Whitehead family established their home in the new pioneering settlement of Port Cooper Plains which was later renamed and now known more famously as Canterbury. Two of James Prebble’s brothers and their families from England also came and settled in the area. For some years James and his family worked for other settlers as labourers. Around 1850 he and his family were able to lease a parcel of land which was known as a ‘run’. It was here that they grew their livestock population and farmed the land. The land was known as Run 10. Over time and as the land became available for purchase the Prebble brothers began buying it up. Along with other settlers to the area. Eventually the area became known as Prebbles Town which became Prebbletown and then Prebbleton. Prebbleton was chosen primarily for it’s arable land and ability to successfully grow a variety of food crops and support the growth and farming of livestock. In particular – sheep. Prebbleton remains a small town today in the Selwyn district of Canterbury. 1848, a double-wedding celebration: Wellington Independent Vol IV, 307, 20 Sept 1848. Married – At Karori on Tuesday the 19th inst, by the Rev. J. Watkin, Wesleyan Minister. Mr. Alex Monk to Miss Ann Maria Prebble; also Mr Richard Prebble to Miss Mary Elizabeth Whitehead, all of that place. I won’t focus too much on the Prebbles in England and New Zealand here, only because there is already a fabulous amount of information available online written by Prebble descendants. Try here. Between 1853 and 1864 James Whitehead is listed on the New Zealand electoral rolls as living in the Upper Hutt, Wellington. His occupation listed as Sawyer (a wood-cutter). On the 3rd August 1854, James married Sophia Shirley at St Peters Church in Wellington. The church had only been built a few years beforehand in 1848. Let me assure you, if you think the Whitehead’s arrival is only a very small representation in the new colony of New Zealand? Well they were very productive. The name Whitehead particularly across the north island is common in the extreme. Other Whitehead’s of course came from England (even Kent!) and afar however our one’s were not slow in planting a new crop. James and Sophia had twelve children. Eleven of whom reached adulthood. James sister, Mary Elizabeth Whitehead had six children. They were all Prebbles! In case you are confused? Mary Elizabeth married her younger step-brother Richard Prebble on September 18th 1848 in Karori Wellington. Both families were of the Wesleyan faith. They were married by the Rev. J Watkins. So her step-brother became her husband and her step mother in law was also her mother. Mary Elizabeth and Richard lived their lives and raised their children in Prebbleton. I think we can safely draw a line under the relationship between the Prebbles and the Whiteheads and be assured that the family were close and that the Whitehead children were looked after well by their step-father. I wonder at reunions did you have to ask whether you were a Prebble or a Whitehead-Prebble? I did find a reference to a Prebble who’d got in a bit of strife with the law and used Whitehead as his alias. It didn’t help him much he still got two years in the nick! So I’m satisfied these two families really pretty much joined up forces together. James died in 1877. Death of an Old Settler – Our readers will learn with regret the death of Mr James Prebble of Prebbleton, which took place on Wednesday evening last. Mr Prebble was one of our oldest settlers, having arrived in Wellington by the Aurora in 1840. He came to Canterbury in 1846 and settled in that part of the province which bears his name. Here he has resided with his family until the time of his death. Reported in the Press. June 1877. Ann Maria died 21 March, 1879 and is buried with her second husband James who died in 1877. The newspaper report read: This day one of the Canterbury Pilgrims, died suddenly at her residence, Prebbleton, yesterday. The deceased lady has been bedridden for some time. Poverty Bay Herald, 22 March 1879. The Grey River Argus on the 4th April published; A very old Canterbury settler, Mrs Prebble of Prebbleton, has died at the age of 78. The Colonist published on the 22nd March 1879. Mrs Ann Maria Prebble one of the Canterbury Pilgrims at Prebbleton. The deceased was 68 years of age. (yup they had different ages reported). The Press newspaper reported on the 21st March, SUDDEN DEATH: – Mrs Prebble, for many years a resident in Prebbleton, and a very old colonist, died somewhat suddenly at an early hour yesterday morning. She had been bedridden for the last two or three years, but an apparent change caused her friends to send for Dr. Guthrie. She expired shortly before his arrival. The deceased lady was in her seventy-eighth year. Now sometimes from a historical point of view headstones are even more awesome than what they first appear. Pay attention to this one. ‘ James his wife Ann, his son Richard and his wife Mary arrived Aurora’. James is buried with his son and his wife, her daughter, his step-daughter and she was Richard’s wife and yes they all came to NZ together on the Aurora! Pretty cool huh. Hate to burst the bubble but I do believe the James Whitehead you refer to as being part of the swing riots is James Whitehead of Lyminge, labourer, who is married to Sarah and resided in Lyminge – not our James Whitehead who was married to Ann Stone and who was most likely residing in Kennington as both his children Mary (1828) and James (1832) were baptised there. Hi Judith, I went back and have completed a glut of research but cannot tie our James in directly to the James of Lyminge. Thank you for bringing this to my attention. I would still like to know what became of him. He just sort of disappears. Will keep looking.